About 150,000 civilians remain in this fourth city of the Reich, which had a peace-time population of 772,000. Many seem to be of military age, and the discovery of a number of abandoned uniforms suggests that quite a number of these "civilians" were yesterday Wehrmacht or Volkssturm. Only three men of the Volkssturm have so far been taken prisoner in Cologne, and one claimed that he was "really a civilian" and should be sent back home, not to a prisoner-of-war cage. All civilians are confined to their houses, except to get food and water. The usual Allied proclamations were being posted in the city to-day. Civilians must hand in all cameras, radio sets, and arms. Anybody found in the streets after dark is liable to be shot. Anybody found looting will be shot. Great quantities of enemy material have already been captured. The prisoners are a mixed crowd. Dozens of different uniforms are reported, and Volkssturm prisoners taken have been dressed in postman's, fireman's, policeman's, air-raid warden's, and every other kind of uniform. Most of the civilians seemed friendly—even glad that the Allies have arrived. Some were frightened—"Nicht Nazi" ("Not Nazi"), they muttered. The First Army troops who reached the outskirts of Greater Cologne yesterday morning and pushed through to the green belt dividing the outer city from the main town resumed their drive towards the city centre just before dawn. There is evidence everywhere of unpreparedness, which has taken even army officers by surprise. Many railway bridges over the main roads have been left intact; if these had been blown Allied progress would have been greatly impeded. Resistance has been on the whole light and scattered. It is too late now for the Germans to do anything about it. Main opposition is still coming from small-arms sniping and some machine-guns. The outer residential areas of Cologne are marked here and there, but not greatly damaged—evidence of the accuracy of Allied bombing. The Germans were expected to make some sort of stand where the green belt bordering the Ringstrasse separates the outer from the inner city. However, there was the slightest resistance here with no prepared positions. American tanks pushed ahead to cross the huge marshaling yards in the north-west of the city. These were heavily hammered by the air forces and the surrounding houses are nothing but burnt-out, blackened shells amid acres of desolation. On the left, or north, flank stiffer opposition was met at the Ringstrasse, including heavy and small-arms fire and fire from light A.A. guns. Inside the green belt towards the Rhine Cologne is virtually torn apart. There is street upon street of rubble and devastation. American infantry elements are using different methods in this city. They are pushing on and by-passing many of the houses instead of clearing up as they go. They are closely following up the tanks and routing out snipers, of whom there are quite a few. I was amazed to see the difference between the outer parts of the city—the little-damaged residential parts—and the utter wreckage in the industrial areas. The marshaling yards were mere masses of twisted, rusty rails, battered trucks, and deep piles of rubble from which dust and smoke were still rising. Crumpled trams stood bullet-ridden and some had been thrown off the rails. Coming into Cologne I saw, only a mile or so outside the city, several nursery gardens where the greenhouses had all the glass intact. From a few hundred yards the cathedral looked very little damaged. Some of the Americans carried a "Stars and Stripes" to fly from it. It will probably take a few days before Cologne is completely cleared, not so much on account of the resistance as the size of the place. There were many straggling groups of civilians, pulling or pushing prams, wheelbarrows, and small wooden carts containing bedding and odd bits of furniture. The outer suburbs were completely deserted, the cobbled roads stretching empty ahead. While from nearer the Rhine there came sounds of fighting, a spasmodic shot and sometimes the deep rumble of tank engines, the area around the green belt seemed like some dead and long-forgotten town. As I turned corners or drove down some of the broad, straight streets, it was only occasionally that I saw collections of American tanks, men, and motor transport. — Reuters Special Correspondent. "It is officially estimated that 85 per cent of Cologne is in ruins. The devastation is far worse than I saw in Stalingrad and there is nothing anywhere in Britain to compare with it. Although the official estimate is that 85 per cent of the city is in ruins, from what I saw to-day I should say that the figure is more like 95 per cent. 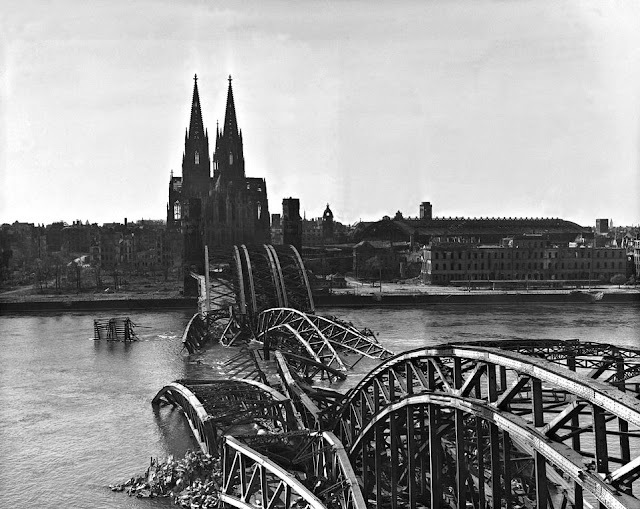 "Allied air forces have dropped some 42,000 bombs on Cologne in four years. To see the effects of the bombing numbs your brain. "Air Force officers say that there are 65 other German cities just like Cologne, and Düsseldorf will probably be worse."